Tanghalang Pilipino's Golden Child (above) and PETA's Batang Rizal (below) are among the topnotchers in the third quarterly citations of Gawad BUHAY! This performing arts awards program is organized by the Philippine Legitimate Stage Artists Group (PHILSTAGE). Productions by Tanghalang Pilipino (TP), Ballet Philippines and the Philippine Educational Theater Association (PETA) dominated the third quarterly citations of Gawad BUHAY!, the performing arts awards program organized by the Philippine Legitimate Stage Artists Group (PHILSTAGE). 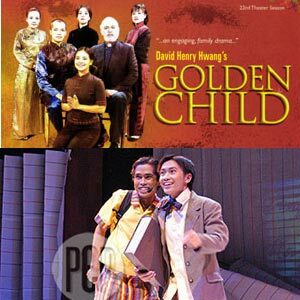 Tanghalang Pilipino's Golden Child romped off with a total of twelve citations while Ballet Philippines La Revolucion Filipina and PETA's Batang Rizal tied with seven citations each. Winner of the Tony and Obie Awards in the United States, Golden Child tells the story "of a traditional Chinese family on the cusp of jarring change." It merited jury citations for outstanding play, stage direction (Loy Arcenas), ensemble performance for its cast, female lead performance in a play (Liesl Batucan, Tina Chilip, Irma Adlawan Marasigan), male lead performance (Arthur Acuña), translation (Dennis Marasigan), lighting design (Barbara Tan-tiongco) , sound design (J. Victr Villareal), set design (Loy Arcenas) and costume design (Gino Gonzales). Ballet Philippines' La Revolucion Filipina earned seven citations for outstanding dance production, choreography (Agnes Locsin), ensemble performance, male lead performance (Biag Gaongen), lighting design (Katsch SJ Catoy), set design (Mio Infante) and costume design (Victor Ursabia). It tied with PETA's Batang Rizal, which received citations for outstanding play, stage direction (Dudz Terana), ensemble performance, featured performance (Willy Casero), original script (Christine Bellen), libretto and musical direction (Vince De Jesus). Major citations were garnered by Tanghalang Pilipino's The Virgin Labfest entries Ellas Inocentes, Ang Bayot, ang Meranao, at ang Habal-Habal sa Isang Nakababagot na Paghihintay sa Kanto ng Lanao del Norte, Ang Kalungkutan ng Reyna, Three Sisters and Pamantasang Hirang. PETA's Mga Kuwento ni Lola Basyang and Tosca also figured prominently in the citations list. Gawad BUHAY!, otherwise known as the PHILSTAGE Awards for the Performing Arts, honors outstanding accomplishments in theater, dance and music among PHILSTAGE member-companies. Quarterly citations, nominations, and winners are juried by an independent panel of performing arts practitioners, critics, academicians and enthusiasts invited or selected by the PHILSTAGE Board of Directors. "The jury members are required to watch all productions of Philstage members to ensure a fair selection process," stressed PHILSTAGE President Fernando Josef. The jury meets quarterly for the citations from which will be culled the nominees qualified to vie for the annual award to be announced and honored in fitting ceremonies during the National Arts Month in February 2009. PHILSTAGE groups together the country's leading and established performing arts companies which include Actors Actors, Inc. (AAI), Ballet Manila (BM), Ballet Philippines (BP), Gantimpala Theater Foundation (GTF), Organisasyon ng Pilipinong Mang-aawit (OPM), Philippine Educational Theater Association (PETA), Repertory Philippines (REP), Tanghalang Pilipino and the Triumphant Peoples' Evangelical Theater Society (TRUMPETS). It can be reached via email philstage@tri-isys.com.